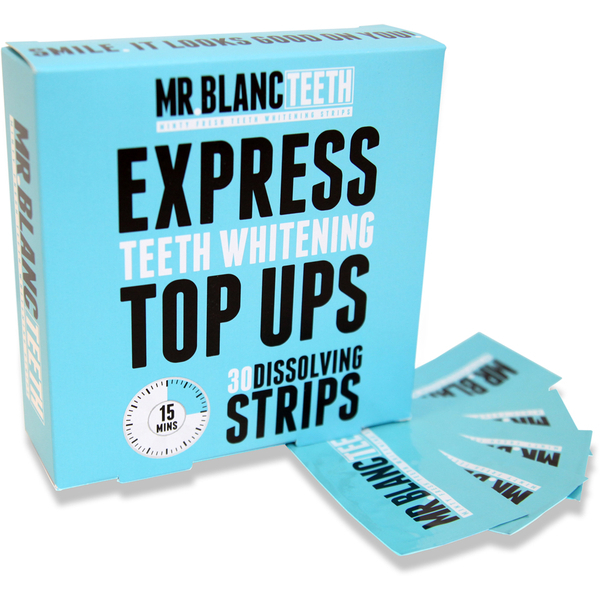 Achieve natural pearly whites with Mr Blanc's Express Teeth Whitening Strips, a supply of peroxide-free whitening strips that dissolve on the teeth to safely whiten and brighten your smile, on-the-go. Convenient and easy-to-use, each flexible strip fits perfectly to the contour of your teeth, delivering a host of enamel-friendly ingredients that remove stubborn stains and reveal a pure white smile; all without sensitivity to the teeth or gums. The thin, transparent strips sit comfortably on the teeth, and dissolve after fifteen minutes; deeply embedded stains from coffee and red wine are reduced, and if used correctly, your teeth appear visibly whiter after just fourteen days. Expect beaming teeth with zero mess or residue. Can be used out-and-about, anywhere, anytime. Open from the top of the strip to reveal ONE whitening strip. Moisten your teeth with tongue and then apply the strip to your upper teeth. Fold the excess behind the teeth. Allow your top lip to rest over the strip. You can also repeat the process with the lower teeth. The strip dissolves on the teeth in 10-15 minutes to form a gel and then completely melts away after a further 5-10 mins. Fast delivery to France. The result is really impressive. My teeth have been whiter than before!